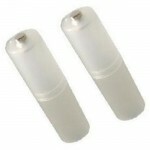 Gadget Accessory Store offer a small selection of products associated with batteries, such as dummy batteries, blank batteries, battery converters and chargers. Just stick an AAA battery into the converter and it becomes an AA battery. AAA to AA Battery Convert..